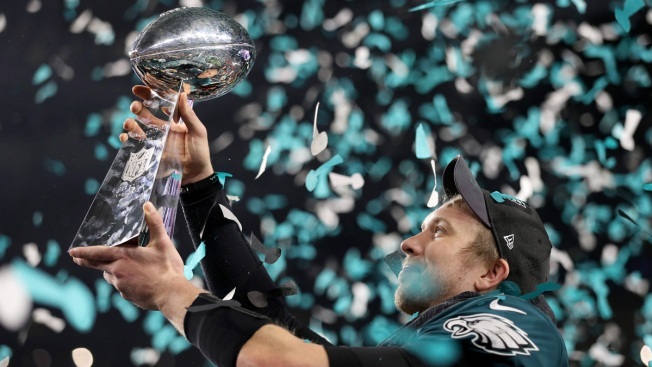 Nick Foles #9 of the Philadelphia Eagles raises the Vince Lombardi Trophy after defeating the New England Patriots 41-33 in Super Bowl LII at U.S. Bank Stadium on February 4, 2018, in Minneapolis, Minnesota. Sylvester Stallone, an adopted son of Philadelphia for his "Rocky" films based in the city, along with other big names, including President Donald Trump, took to social media to congratulate the Philadelphia Eagles for winning their first Super Bowl. YO, EAGLES YA DID IT !!!! !